I just think these three have some real style to them--all silvery and blue with the shock of bright red in the middle. *love* They range from historical fiction, to fantasy, to steampunk and I am looking forward to them all. And, even though the cover for Splendor isn't my favorite of the three (favorite dress=the red one on Rumors, favorite cover=the one for Envy), I have to say the extravagant dress theme has had a really fun run with the Luxe series. The fourth and final installment in the Luxe series. I will be very interested to see how it all plays out. I have thoroughly enjoyed this series and, as it reads like Peyton Place set in turn of the century New York City, I feel perfectly comfortable being as petty with it as it is with me. As such, I will not be okay if a certain someone dies, if another someone does not remarry (the right suitor, mind you), and if a third someone does not get what's been coming to her for four freaking books. That is all. Splendor is due out October 27th. I just stumbled across this lovely little offering from Egmont USA. After reading the synopsis over at Alexandra Bracken's site, I find myself sort of humming with excitement to read this debut novel. Full of a land beset by storms and quakes, a mysterious wizard who brings rain, and a young woman stolen from her home who may hold the key to it all...I am so there. Brightly Woven is due out March 23rd. 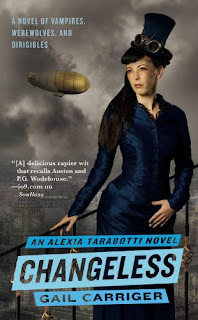 The second novel in The Parasol Protectorate, Changeless (subtitle: A Novel of Vampires, Werewolves, and Dirigibles) is the sequel to the funny and fun Soulless and follows Miss Alexia Tarrabotti on her outlandish escapades in London. Without a soul but with Scottish werewolf Lord Maccon, I do wonder where Miss Tarrabotti's terrible luck will take her next. Changeless is due out March 30th. I haven't read the other two yet, but as far as Splendor goes, amen, amen, and AMEN. I really love the cover for Changeless...so different. Alicia, it really better. Otherwise, the PAIN! Mandi, I know! I love how eye-catching it is. And the tagline. These are lovely! I do love the shock of bright in the middle of all of them. It hadn't occurred to me why they are so eye-catching and delicious, but I think you put your finger on it. Yummy. Carolyn, they do look pretty nifty together! OK, this has nothing to do with your current post, but I just finished a Diana Peterfreund marathon the last couple of weeks and I am just coming up for air. Other than a few brief moments of TMI (Amy and George), I LOVED all the books. The library didn't have Tap and Gown, so I just need to get my hands on a copy ...... Poe....SWEET! I totally didn't see that coming.....I use to be good at telling who would end up with who, but that took me by surprise and I love it! But I think I liked Rampant even better.....evil unicorns......brillant! I can't wait to see what else the series has in store. Thanks for the suggestion. I'm really glad you loved RAMPANT as well. The way she did killer unicorns was brilliant indeed. I'm slowly making my way through the Luxe books - just picked up ENVY. They look purty sitting on the shelf together. 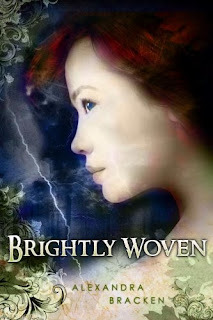 :) Oh, and I have an ARC of Brightly Woven - it looks so good! I've been wanting to read Soulless, too - hopefully soon. Chelle, you gots an ARC of BRIGHTLY WOVEN?! *covets* I read the first chapter on her site today and loved it. Oh my... I almost don't even care about the content of the Luxe books. They are just too gorgeous NOT to sit on my bookshelf. It's a good thing they are so fun to read. I can't WAIT for Splendor, of course, and I just heard Soulless booktalked this week at a conference and I'm DYING to read it. Oh my word.